A new sensory pod is being opened at Yorkshire Wildlife Park in March 2011. It is being funded by Doncaster Council Aiming High project and is therefore a free facility for people with disabilities to enter for 20 minute sessions, (although you do need to pay to enter the park it self). 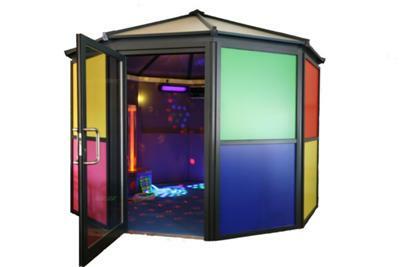 If you are thinking of doing your own sensory room it may be worth trying this one out to see what works for you. I visited the Yorkshire Wildlife Park recently with my three young children, one of whom has autism. We had a great day out and tried the sensory pod at the end of the day before heading home. It was fantastic for us all to have our own space together to calm down from a very exciting day and made the journey home much easier than it might have been otherwise. Inside the sensorypod all the outside noise was cut out and the lights and music were very relaxing. We just chilled out on the bean bags and padded floor listening to music and watching the bubbles go up the tube. It is a really good idea and so unusual to find something like this in a public place. I definitely recommend trying it.